Blog Sustainable Aviation Symposium – Free on YouTube! Sustainable Aviation Symposium – Free on YouTube! 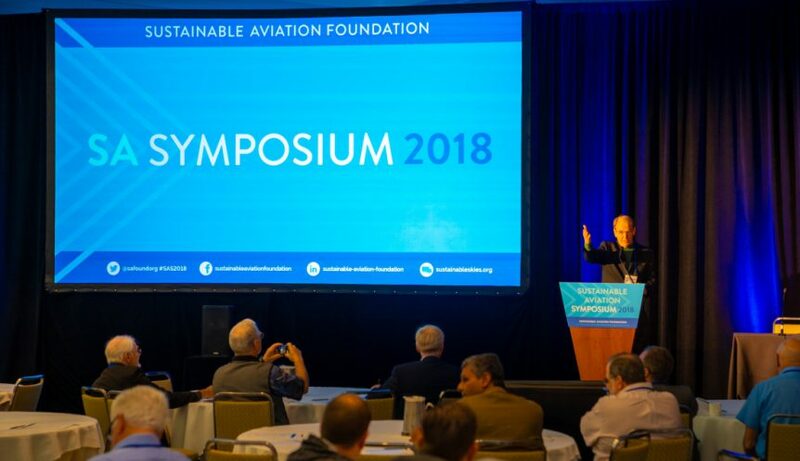 The 2018 Sustainable Aviation Symposium was a master class in aircraft design, electric and hybrid power, and the strategies that will make green flight a reality in our near and distant futures. The considerable knowledge imparted in that gathering is now available for your education and enlightenment on YouTube. Go here to see the entire 2018 Symposium program, complete with links to a video of each speaker’s talk. Or go here for the library of presentations on YouTube. Either link provides high-quality video of the 20 presentations from this year’s Sustainable Aviation Symposium. You will see all the slides in each presentation and hear each presenter’s eloquent exposition. These range from the simplest of garage-based projects (your editor’s attempt to build the world’s cheapest electric airplane) to far-ranging inquiries into the real-world blessings and possible consequences of having an aerial armada of commuter vehicles hovering over our cities. Like potato chips or peanuts, you probably won’t be able to stop once you’re sampled just one. We share just a few previews here. Tine Tomazic, for instance, took us through an examination of MAHEPA (Modular Approach to Hybrid-Electric Propulsion Architecture), the European Union’s push toward creating aircraft that will reduce overall emissions. Starting with current four-seat Pipistrel craft, the HY4 and Panthera/Hypstair, MAHEPA would test fly these by 2020 in their fully-developed hybrid configurations, then use the findings to work toward 19 and even 70-seat four-hour regional airliners. Dana Lodico, PE and a Director at the Institute of Noise Control Engineering of the United States, Inc., shared a wealth of empirical testing of road surfaces and tires to demonstrate that significant beneficial changes can make ground operations at pocket airparks less disturbing to surrounding neighborhoods. Greg Cole, founder of Windward Designs and presenter of this year’s Paul B. MacCready Honorary Lecture, shared a history of his designs, including his SparrowHawk, DuckHawk, and GosHawk sailplanes and motorglider, all high-performance craft with winning performance. Topping it all, his design for the Perlan II set the world altitude record for sailplanes on September 2, less than three years after its September 23, 2015 test flight in Redmond, Oregon. His insights on design and methodology for electric aircraft are invaluable. eVTOL vs. cSTOL? This question provokes the most heated arguments among even friends. You can see examples of both from the keynote address by David Ullman comparing VTOL to STOL aircraft to Dr. Brien Seeley’s concepts for regional air transportation promoting conventional, but extremely short takeoffs and landings. Mike Hirshberg’s elucidation on trends in the rotary-wing world illustrate the over 100 electric vertical takeoff and landing craft coming to heliports near all of us. Please look at the other videos, since they comprise a wealth of information about where we are going toward a cleaner future. The Symposium’s last three speakers and their final group exploration of realistic visions and a critique of different strategies cannot be matched for clarity and understanding. The remaining presentations are equally challenging and enjoyable. You can always watch cat videos.